How precious is the anointing of God! As artists, surely you've experienced His anointing in some measure. When I sense the presence of His anointing, ideas and ability flow effortlessly. I find myself free of the stress of striving for a good outcome. Sound familiar? It is a manifestation of His presence, found in the secret place of worship, entered into as deliberately as entering a vault wherein great treasure is stored. It is found in a state of trust and rest, even while I’m busy at work. In the presence of that anointing, I enjoy quiet satisfaction in the creative process, in stark contrast to my otherwise restless nature! There is no doubt that I’m being helped with just the little push that I need at the my level of ability. Artwork created by His anointing are neither masterpieces nor great demonstrations of supreme excellence in keeping with God’s genius. I readily admit that. But they are always way more than I was capable of! The role of the Holy Spirit as my Helper has become infinitely more precious as each year goes by. I know that He could, in the blink of an eye, make my work stunningly beautiful as an obvious reflection of His immense creative capabilities. Yet He chooses not to. Instead, His anointing helps me incrementally, in little steps edging me closer and closer to something marvelous. The more I depend upon and create by His anointing, the closer I draw to a destination of excellence that I never envisioned for myself. 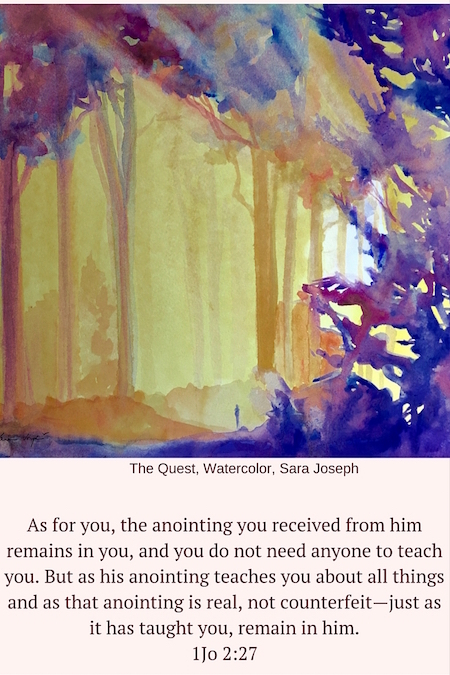 Seeking His anointing is a continually surprising quest, a moving target, a goal I cannot define, elusive and just out of reach, but promised and present, if pursued. The more I grow as an artist, the more amused I am by how little I truly know. How meager is the measure of whatever I consider my innate “talent”! On the other hand, when I create by the anointing of God, I grow certain of outrageous possibilities that God has for me despite my limited natural abilities. He will lead me to them, not in a great giant leap, but in little steps, as I choose to be faithful. This is true for each of you, which is why I struggle to articulate it here in the hope that it will motivate each of you to seek God for His anointing. It is frighteningly easy to create without His anointing and still produce beautiful work that others may commend. But something will be missing, some essential element to the work that is hard to describe but can only be spiritually discerned. We are universally programmed to crave and appreciate the authentic. Perhaps that is what God’s anointing on a work highlights. As I pursue God’s anointing and presence with a passion, I resolve to purposefully remaining free of grudges, offenses and unresolved sin. I cannot nurse anger, resentment or bitterness, regardless of how justified I may feel. It requires obeying His voice and staying as close to Him as possible, before ever setting brush to paper. The obedience of a yielded spirit is the only chamber that the Lord will honor with His anointing. It takes little to lose the anointing and much to gain its precious presence. I'm making it my goal to yield more and more, in righteousness and purity to God, in order to enjoy His anointing on my life and art. You can too. I pray that you will not dismiss what I’ve written as being too much to strive for. There is nothing quite as precious as creating art by His anointing. Once you’ve experienced it there is no turning back. Would you be satisfied with a Dollar Store rhinestone when a flawless diamond is within reach?